Klayman: No Surprise That This Borderline Communist Rag Slate Conveniently Fails to Mention How Rosenstein Proposed Wiring Himself to Wage a Coup vs. The President! 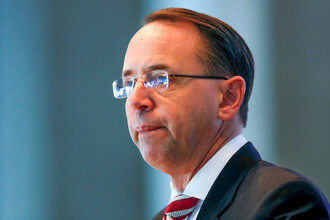 Rosenstein Will Be Prosecuted by Our Citizens Grand Jury! Deputy Attorney General Rod Rosenstein will soon leave the Justice Department that he joined as a newly minted lawyer nearly 30 years ago. He is, by all accounts, a skillful attorney who spearheaded a number of successful public corruption prosecutions and won widespread respect from members of both parties en route. But as is often the case, he will be remembered best for the worst moments of his career: his letter providing a cover story for the firing of FBI Director James Comey; his baffling failure to recuse himself from the special counsel's probe into possible obstruction of justice by President Donald Trump; and his wingman role in Attorney General William Barr's bid to make Trump's obstruction issues melt away.